We were up on Tuesday, Aug. 7th at 7 am and it was a foggy start to the day out here. Off in the distance, nothing too close. We enjoyed our first coffee and tea together while I finished my 2-day blog post. Sorry about that, folks, it was a long one. Hopefully there were enough pictures so you didn’t get bored! It was a great couple of days and the busy-ness was more important than making sure a post got sent daily. Bill checked propane tanks, thinking he needed to fill one, but they were fine and did not need a refill at all. But we did need gas in the Rav. He drove to Durham to top up the fuel at Esso, which was up this morning and made a bank withdrawal as well as located some Warfarin mouse catcher stuff. Yes, we’ve discovered that one or two (?) have found a way to get into the Suite, up through the hole in the under-sink cupboard, into the garbage can and straight up into the linen drawer. Little beggars! What a mess they made!! Once previously, we noticed their little black droppings in that drawer but this time, he/she/they managed to drag a couple of peach pits, some lemon rind from Saturday’s dinner and even a plastic cream cap up there! Time to take action, so Bill bought this poison today. It isn’t anything we have to worry about Clemson getting into since it is placed back behind the garbage can, in the cupboard with a drink of water to encourage them. 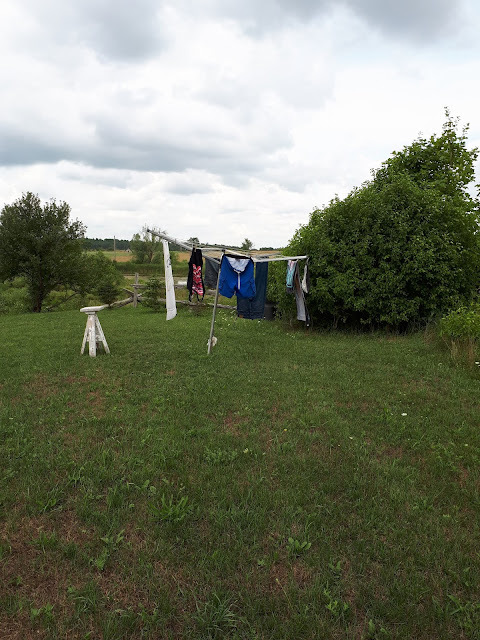 The towels and swimsuits we wore yesterday were still in the Rav so he brought those in and I hung them on the clothesline. His jeans and a pair of jean shorts that weren’t quite dry when we left yesterday got a 2nd wash in the overnight rain so they are also still hanging out. Remember when we wanted to wash our jeans over and over to get them to fade? That doesn’t happen anymore since you can buy them already faded (for a fortune!). Inside, I downloaded 3 Free books from a site my sister, Gayle, sent me. I hadn’t used my Kobo for a very long time so got it out and made sure it was charged up. Unfortunately, when I opened the app it needed an extensive update. Because I don’t know how big the update is or how long it will take, I didn’t go ahead with it. Maybe I can update it one day when I’m in town at Rob and Pat’s. I don’t think they’ll mind. In the meantime, the books can wait, I still haven’t finished the hard copy that I’m reading. Bill and I had some yogourt and I sorted through some pictures and backed up my July photos onto my external hard drive. 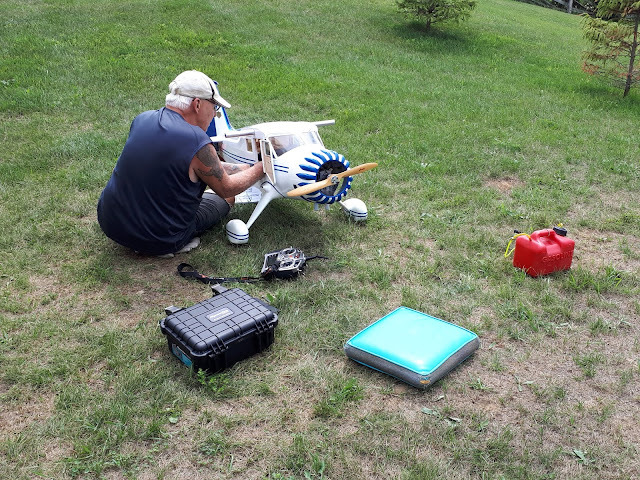 He went back outside to continue to work on his Stinson Reliant plane engine. Still no luck, says he needs a new receiver so ordered one from AVF. Frustrating for him, for sure. Donna also wanted us to send updated pictures for Mom’s poster board. For some reason, a while ago, Mom took it down and removed all the pictures. I hope it wasn’t a day she was mad at us for something. That would be sad. Anyway, Donna slipped the board home and will put pictures back together with our names. A different picture of me is in the works since in the last one my hair was up in a clip. Mom said I didn’t look like that. It was a lazy afternoon, for me, at least, and it felt great. No obligations to go anywhere or do anything. Other than bringing in the few clothes off the line, a walk down the lane, harvesting veggies and prepping supper, I haven’t done much at all. I’m so close to finishing my book that I may have to do that before America’s Got Talent starts at 8. At 5:30 I got the last two cobs of corn out and 2 chicken thighs and 2 pork chops seasoned. Bill lit the Weber and grilled everything up. I boiled the corn inside and set the table. There was about 3 servings of Cabbage Salad left from yesterday so we each had some of that as well. 1 chop and 1 cob of corn is for Bill’s supper tomorrow night. 1 thigh and salad will be mine. Bill is heading to work in the morning after almost 2 full weeks off. That will be a real change, just after getting used to being home. It has been nice but he’ll miss the paycheck at the end of the week! Supper was very good, I really enjoyed the chicken. After dishes he made up his sandwiches for tomorrow and Thursday’s lunch. At least it is supposed to cool down a bit, I think, so he won’t be working in 30C temps. The temperature today has been 26C and above so plenty warm. No complaints, there is always shade to find. The humidity is down somewhat which has been nice. I’ve been messaging back and forth with our friend, Deb D. in Escanaba, Mi tonight. Nice to stay in touch with our friends. Sounds like we’ll see her and Tom in Quartzsite again this winter. That is great! And Shirley and Ken in Nevada have it in their sights too. It will be a real ‘family’ affair again. I finished working on my post too late so AGT was already on. This has been a nice, quiet day. I hope yours has been a great one too. This is one way I like chicken, it was delicious! Thank you for stopping by. Your comments are always welcome. Dress looks very nice! I love the color! Hate those bratty little mice. Can you plug the hole?? Otherwise lots of traps!!! Also like all your green growey things. Thank you Nancy. There is a large hole where the hoses come up from underneath to the under-sink area. We are going to try and close it up as much as possible at least to keep them from the edibles and kitchen area. Just a word of warning. If you poison the mice they can die in the walls or somewhere you can't get them and make quite a stink. If you can setup snap traps in places where Clemson isn't able to get to them. That way, SNAP, and they're done like dinner. They love peanut butter. Hope you catch all the nasties. I hate those buggers!!!! I set out snap traps just when it's sitting in our driveway. I caught 4 of them recently. I use the new fangled type not the old wooden ones that are so hard to set. Good luck. Thank you so much! I thought Bill was buying the Snap traps but this is what he came home with. If there are new fangled ones so I can set them without losing a finger (haha) that might be the ticket. Thanks for the advice and tips. Too bad about the mice guys think it has been 10 years since we had to deal with them. Nice to have the quiet relaxing days to enjoy. we love them too. Nice to get your your KOBO up and running again, We have more free books downloaded than I ca read in my lifetime and love it, hope you enjoy it. Think Bill will enjoy being back at work again. It is too bad about the mice, sometimes we don't even know where they are hhiding. This was a great day, peaceful with no noisy neighbours! haha, kidding! My Kobo and I reacquaint every so often. I still prefer my hard copy so I can flip back in pages if I lose track of who's who in a mixed up story but I have over 100 books to read on it when I want to. If you put steel wool in the opening they wouldn't come through. we also put a bar of Irish Spring soap by the hole and they don.t like it either. When it comes to mice I will try anything. I really like your dress looks nice on you. So glad you had a great time with your friends looked like lots of fun. thank you Janet. The opening is too large for steel wool the way it is so we'll have to make it smaller first. My sister tried the Irish Spring soap when I told her about it and the mice carried it from the floor up into a light sconce in their trailer!!! Figure that out! Hi Pasty, We had several mouse get in our 5th. Now I use spearmint and peppermint oil on cotton balls under the sinks and in several drawers. No more visitors since starting this and the rv smells good. Good luck. Hi Cheryl. Thank you! Oh, that sounds easy enough! I can do that as an added prevention. They are so frustrating and we have just begun, I'm sure! Sometimes when there is so much going on, you just have to do a two day blog post - right? I feel for you with the mouse issue. We had one not soon after we bought our RV. Dean set traps, checked for places they could get in, and we also bought Fresh Cab Rodent Repellent from Amazon. We keep it in the basement, and before we went full-time we would put it inside over the winter months. 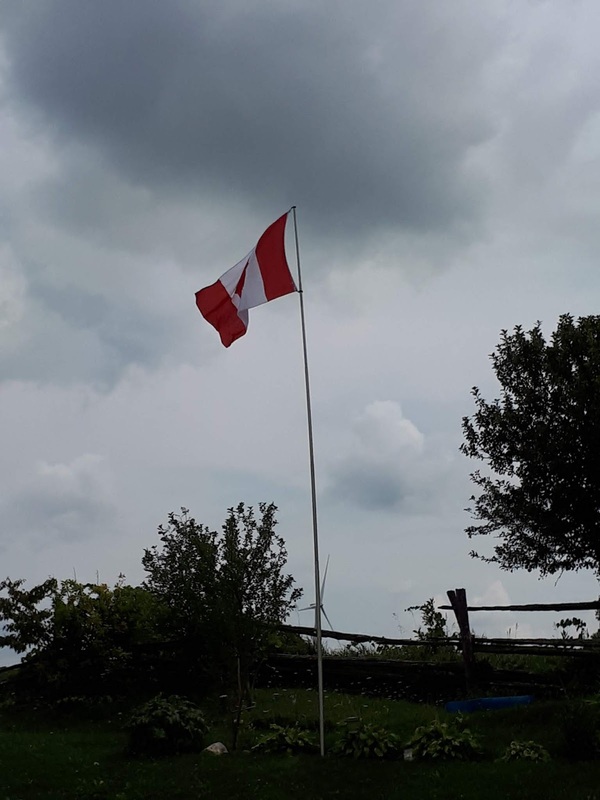 It's too strong to leave it inside while we are living in it, but so far, knock on wood, we've not had another visitor. Eek! Bill's new shed is looking great. I know he must be anxious to get it finished. 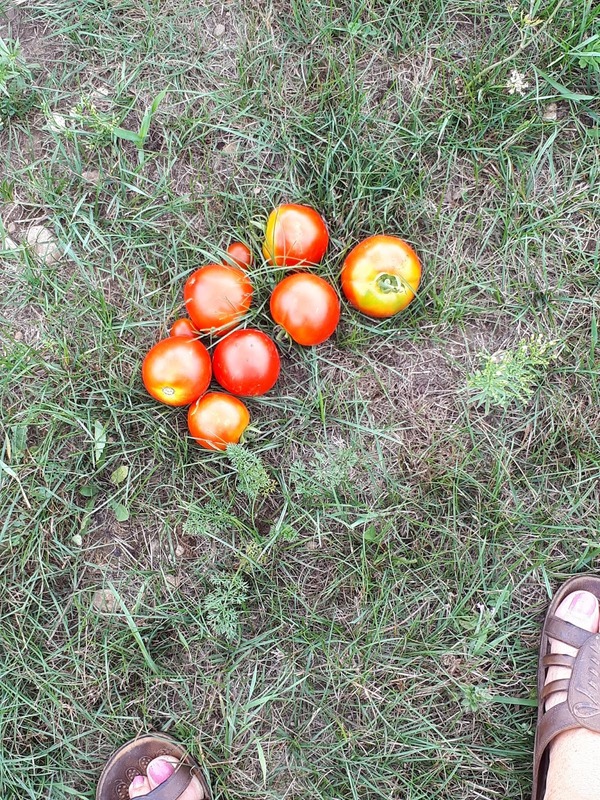 Your tomatoes look great - I miss having fresh ones. One last thing, the pool party looked like so much fun, good food, family - what can be better? thanks for your nice comment. I hope we can get rid of the mice as easy. I'm knocking on wood too. Bill is loving the shed and can't wait until it is done. 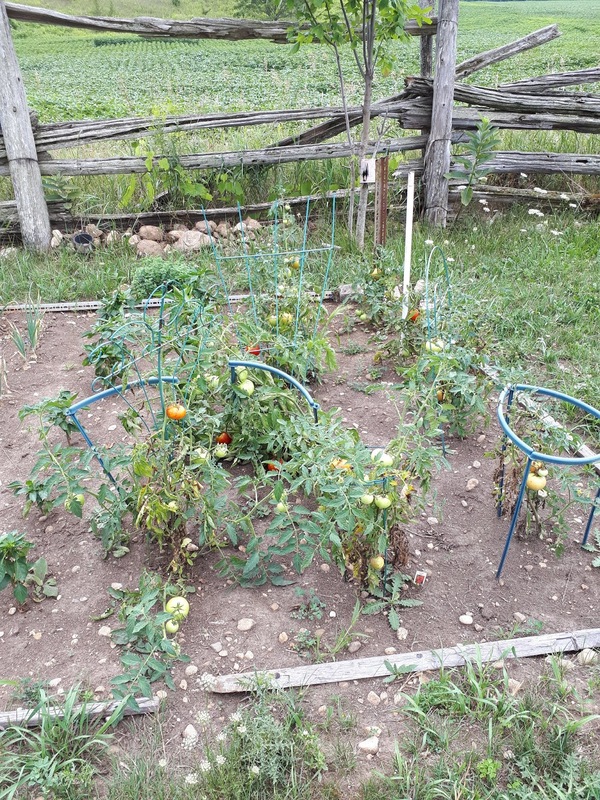 I am happy to have my own tomatoes, they taste so good.